This year’s awards took place on World Usability Day – which is apt, given the quality of the submissions – and we had nearly 200 people attending from all over the country, making it one of our busiest years ever! Kicking off the evening was our keynote speaker, Marten Jonsson, Senior Design Manager at Google, who contemplated “designing for the next billion”. It was a great talk that raised some thought-provoking topics for the audience. The winner of the night was undoubtedly the Beano team, who not only picked up the coveted ‘Best User Experience’ award, but also the ‘Best Entertainment & Leisure Experience’ award. The entire judging panel was impressed by how they had moved from the print medium to digital, and embraced the technology – creating a whole new experience for the users. They also did their user testing with children, which is not an easy task. Well done to all involved! The ‘Best User Experience’ award was won by SH:24 last year, Future Learn in 2015 and BBC Sport in 2014 – so you can tell the standards are high! Another great thing to see was the number of entrants on the shortlist using UX to make a positive impact on the offline world: whether it was in the not-for-profit space, like Age UK, Daybook by Humanly, Chron’s & Colitis UK and Entice, Engage, Educate (by Matej Kaninsky of UCL), or in the consumer-facing world, such as easyJet’s travel app. After the ceremony, several of the teams stayed to celebrate with us – this included Rufus Leonard (who were up for ‘Best Transactional Experience’ for their work on The AA’s New Digital World), Bunnyfoot (who won ‘Best Information Experience’ alongside BIMCO) and Kallidus (winner of the ‘Best Education or Learning Experience’ category). The entrants in every category are put through rigorous analysis by the judging panel, and all entries were reviewed and deliberated upon by a number of top-ranking UX specialists and digital experts – and this year was no exception! You can find out more about our judges by reading their Q&As. 2017 was an interesting year for our UX entrants; despite its rising popularity and use, we had no entries shortlisted in our ‘Best AR / VR Experience’ category. On the flipside, we had more student entries than ever – there were 14 projects on the shortlist – suggesting a rising interest and understanding of the importance that UX can play in websites, apps and services. 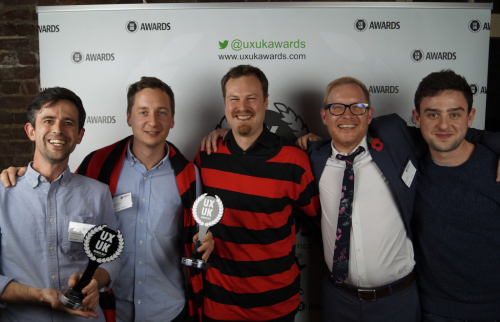 On a final note, we’d like to congratulate all of the winners of this year’s UXUK Awards, as well as those who were shortlisted. It’s work like yours that makes our Awards one of the highlights of the UX calendar. We look forward to what 2018 has in store for us! To become a sponsor of the UXUK Awards 2018, please contact Jo Hutton at jo@uxukawards.com. Have a look at our Facebook page for more pictures of the Awards.